You would think as a nutritionist I would be almost perfect in my food choices. Well, my secret little vice is salt! Yes, that’s right, I do like the taste of salt and have been guilty of adding salt to My food. When my publisher approached me about writing a salt free cookbook, I jumped at the chance to not only prove to my readership, but to myself that it can be done! And what a great challenging project it was! I created 125 delicious, healthful recipes that are easy to prepare and you won’t miss the salt at all! The American Heart Association recommends no more than two-thirds of a teaspoon of salt per day, but it’s easy to exceed that in just one meal. 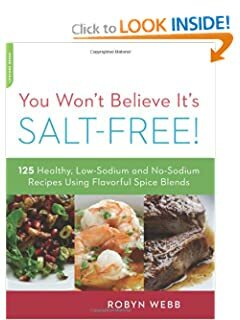 For anyone with hypertension, heart disease, or diabetes—and the millions of Americans whose high salt intake puts them at risk of developing these conditions—You Won’t Believe It’s Salt-Free offers 125 delicious no-salt recipes that take family dinners from monotonous to mouth-watering. Culinary expert Robyn Webb reveals her secret: simple spice blends that anyone can buy or make at home, plus recipes that use exotic aromatics like kaffir lime leaves and star anise to create bold, beautiful flavors. From Chipotle Chicken to Herbs de Provence Squash, there is something for everyone’s palate. Once you experiment beyond the salt shaker, your health will improve and your cooking will too. Pass the salt? No way! None needed when you know the spice is right with my Tuscan Bean Dip! correct the seasoning, adding additional lemon juice if desired. and refrigerate for 1 to 2 hours prior to serving. Serve with pita-bread wedges or crudités. Since I’ve written 15 cookbooks, I guess I am the right person to answer this question! Cookbook writing is not for the inexperienced. It’s hard work to convey passion for food through your recipes. You must be creative keeping in mind your readership’s needs and interests. You have picture your readers in their own kitchens and create a pleasurable, rewarding experience for them; not an easy task! Writing a cookbook is not for everyone. First, be organized and choose a subject you are passionate about. Your love of your subject matter is 99% of it. Work hard and have fun within too. I’ve been publishing since the mid 1990’s and always with a publisher. My two publishers are The American Diabetes Association (since my niche is diabetes) and Da Capo Lifelong Books from NY. These two publishers specialize in books that are healthy cooking, so naturally it makes sense for me to publish with them. I like having the partnership of a publisher versus self publishing and have been fortunate to be publishing all these years and have developed a great relationship with my publishers. But new authors may want to publish on their own to test the waters first. I would recommend serious authors obtain an agent. An agent can protect your work and guide you through contract intricacies. I would say its more challenging today to find a good publisher and agent, but it can be done. Robyn Webb, MS, LN, is an award-winning cookbook author, nutritionist, and the Food Editor of Diabetes Forecast® Magazine. She has written 14 cookbooks, including the American Diabetes Association bestseller Diabetic Meals in 30 Minutes—Or Less! She has numerous media credits, including Food Network, Martha Stewart Radio, Lifetime Television, Discovery Channel, CNN, CBS, ABC, ESPN, and many more. Her work has been highlighted in the Washington Post, Woman’s Day, USA Today, Fine Cooking, and many online health, fitness, and food websites and magazines.